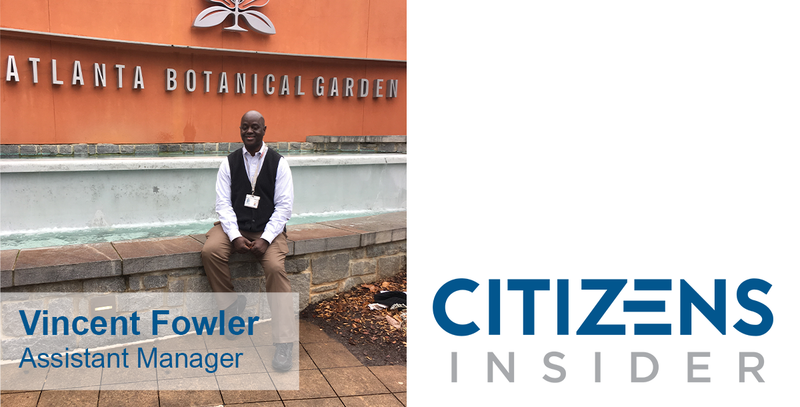 Atlanta Botanical Garden got a good one with our Assistant Manager, Vincent Fowler. Vincent, known lovingly as “Uncle Vince,” has been with Lanier since 1995, beginning his career with us as a holiday shuttle driver at Lenox Mall. Many years later, Vince says his favorite parts of his position as Assistant Manager are learning the hiring and training processes for new staff members and engaging clients and guests at the Atlanta Botanical Garden and the neighboring Piedmont Park. Right now, Vince is super proud of his team for another successful season of events, including the seventh annual Holiday Garden Lights show. Vince has a long history of customer service-based jobs, lending him the tools for success in his various positions at Lanier. He previously worked for Home Depot for ten years, where he was introduced to Habitat for Humanity—a non-profit near and dear to his heart. He also worked in the theme park industry for 20 years, and volunteered for the 1996 Summer Olympics, Super Bowl XXXIV, and the upcoming Super Bowl LIII. He says these avenues have taught him how to be a good listener, lead by example, and exhibit a positive attitude. In addition to the upcoming Super Bowl, Vince is looking forward to growing with the company and learning more about the parking industry as he goes. His goal for 2019 is to work on employee retention and developing his customer service skills even further. Outside of work, you can find Vince hammering away on a Habitat for Humanity project or winning trivia games across Atlanta. Thank you, Vince, for your dedication to service excellence and for your generosity to and involvement with the Atlanta community. We are proud to have such a great role model on our team.